The first step to accessing an FTP server is to know its name. Like a web page, FTP servers on the Internet sport a unique Universal Resource Locator, or URL. It’s what you type into a web browser’s Address bar. Open a Windows Explorer window; press Win+E. You can use either Windows Explorer or Internet Explorer. Because FTP involves working with files, Windows Explorer may make the most sense. Click to select the Address bar. If the Address bar isn’t visible in Windows XP, choose View→Address Bar. Type the FTP site’s address. 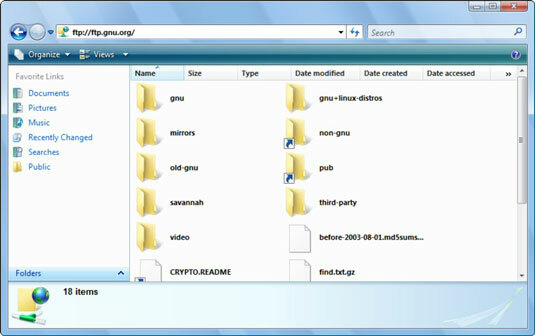 The GNU FTP server is open to the public, using anonymous access. Most FTP servers, however, are password-protected. In a second, you see the window populated with folders and files, just as though you were looking at storage on your own PC. Keep in mind, however, that you’re using a remote computer on the Internet. As an example, here’s how to download the Emacs text editor from the GNU FTP site. You’re now in the location where the files to install Emacs on your computer are located. Select the icon titled emacs-xxxxx-i386.zip. A version number replaces the xxxxx. Otherwise, the icon represents the current version of the Emacs text editor. Press Ctrl+C to copy the file. Press Ctrl+N to summon a new Windows Explorer folder window. If you’re using Internet Explorer instead of Windows Explorer, a new Internet Explorer window appears instead. That’s okay, but what you really need is a folder window, not a web page. In the new window, browse to your Downloads folder. In Windows XP, you have to create a Downloads folder if you haven’t done so already. Press Ctrl+V to copy the file to the Downloads folder window. It takes a few moments to copy the file. After the file is copied, it exists on your own computer. You can open the icon to continue installation, or you can feel free to delete it if you don’t want to use the Emacs text editor. Close the Downloads folder window. Close the FTP server window to disconnect from the FTP server. Browse: To open a folder, double-click its folder icon. The folder takes a bit longer to open because you’re working remotely. Get: To copy a file from the FTP server (to download it), choose the file and press Ctrl+C on the keyboard. Open a folder on your own PC and press Ctrl+V to paste. The file is then copied from the FTP server to your own PC. Put: To copy a file to the FTP server (to upload it), choose the file on your own PC and press Ctrl+C. Click in the FTP server window and press Ctrl+V to paste, thus copying the file to the FTP server.